Hi all, it’s been a long time between blogging! I wanted to share with you another interview with one of our graduates. This graduate was really our very first. Back when the course was the beginnings of what is now the nationally accredited Diploma of Equitation Science. Andrew developed the first course as a way to recognise and endorse trainers and riders who adopted the principles equitation science. Lisa Ashton has been a long time client of Andrew’s in the UK delivering and supporting Andrew’s tour of UK colleges and Universities in the early days, to organising his UK ESI training, assessments and clinics. 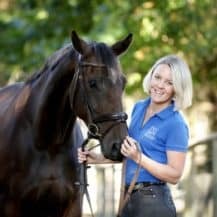 After years of collaboration Lisa was brought on board the ESI team because of her experience in education and knowledge of equitation science, becoming our first course coordinator. Many of our old graduates know Lisa well! “Before Equitation Science had its worthy spotlight, I remember always asking “how?” How does my ‘inside leg to outside rein’ ‘connect’ my horse? How much pressure is too much? How do I make my horse feel good? It was the 1990’s and my coaches; BHS Fellow’s to eventer celebrities would look at me with either a pained or exasperated expression. Chasing trainers had just become a ‘thing’ to fad over, so I was getting lots of practice at reading the facial expressions of equestrian coaches. Whilst also learning my appeasing face, combined with a “sorry *insert my appeasing face*…I just love learning!” I was desperate for a deeper understanding of what I was being asked to do to my horse. I knew the theory and importance of ‘bending my horse around my inside leg’ – having achieved the BHS II and Pony Club A’ Test – but if I asked my coach HOW the inside leg to outside rein physically and mentally achieved ‘bend’ – I would be shut down. How? By being shamed or ignored. Both are very effective at suppressing further questioning or understanding. Back then; I remember wishing I could be someone different. Someone who made her coach’s facial expressions ‘happy’. If I could just nod in all the right places? Remove “why?” and “how?”. In fact just don’t talk – it was only for an hour right? Wrong. I have always loved exploring solutions to be my best. Choosing not to be yourself is never a solution. As I continued my journey to master equitation; knowledge and skills, I taught a new module on the equine degree at Rodbaston College, Staffordshire UK, Equine Behaviour & Training. As I explored new age training methods: Equus, Parelli, Clicker Training, and Tellington Touch, I kept coming back to one question…. what is ‘in it’ for the horse? How does a horse feel ‘joining-up’? How does a round pen (as opposed to a square pen) motivate ‘join-up’? How does a ‘circling’ or ‘porcupine’ game make a horse feel? How does changing from a continuous payment schedule to a variable schedule in clicker training make your horse feel? Clarity of communication. Lightness. Responsivity. These are all qualities of our training. But what learning processes do we recruit to motivate a light response? Or how do you train relaxation to novel stimuli? How do we make our horses feel during our training? On the 25th December 2003 my sister kindly gifted me a book from her equestrian book club. This one small act changed my whole life. I vividly remember feeling a soup of emotions, as each chapter added to my knowledge gaps and understanding. I totally submerged myself in The Truth About Horses by Dr Andrew McLean. Eventually I was convinced to stop for Christmas dinner, only to tell my family all about my epiphany! This book explained all my whys, how’s and what’s. Thank you so much Andrew for sharing your knowledge in such an accessible, easy to understand and supportive book, if you haven’t read it yet, do because it was the smallest, yet biggest step of my equestrian career. Positive Reinforcement is not just for horses! Equicoach.life supports horse lovers globally via web based resources as well as one-to-one coaching for leisure and performance riders who want to be the change for their horse’s mental and physical well-being. In 2017 I decided to create a space for like minded horse lovers – passionate to be the change our horses need. If you see things differently, committed to helping your horse feel good, and value compassionate people, then please come and join us – Coffee with Horse Lovers is a facebook group where you can; review the latest in equitation science, engage in live interviews with leading equestrian professionals , receive free gifts and get the answer to you and your horses problems. If you want to know more about my Rider Mindset Training camps come and join Coffee With Horse Lovers, here you can ask riders what they gained my 6 week mindset camp what does a Horse Lovers Master class entail and any other questions you have! I believe helping more horses requires a healthy spotlight on us. As a coach I translate the latest in equitation science fused with mindset training so riders are their very best for their horse. Why mindset? Because without it, nothing else matters. Success is achieved when knowledge, skills and mindset meet. A lot of our students are out there helping horses, but this approach to helping people is something I’m intrigued by. Being a good horse trainer is not always just about knowing the methods and applying them – there’s a level of skill made through practise (of course) but there is also something that is hard to learn… confidence and composure. Good trainers are already good animal people – they are calm, gentle in their movements and consistent in their actions. That’s what makes them effective, and it’s why horses respond to them so well. So the way I see Lisa’s work with coaching people to perform better (whether it be in competition or day to day with their horse), is important because when you’re confident and composed, you’re more effective. I have just completed the 6 week mindset training camp with Lisa. I was a little sceptical at first, imagining daily affirmations and stuff that I generally find a little ‘eye-rolly’, but it was actually really logical and motivating. The camp is managed through a closed facebook group and you’re encouraged to share your experiences and support others in the group. The group was really varied in types of people – there were people recovering from injury, people wanting to build confidence, people with competition goals, and then there was me – I didn’t really know what I wanted. At first I felt a bit like an imposter because I didn’t feel like I needed mindset coaching. That sounds awfully arrogant, but the truth is I had to think really hard about what I wanted from the camp because I’m not really nervous or lacking confidence. I certainly didn’t feel like I needed to change anything, and the small goals I had didn’t feel unachievable, so why get help? But what the camp did do for me, was make me far more self-aware and actually helped me develop short and long term goals which helped with productivity and motivation. I could see the others in the camp really benefit from the tutorials and exercises and it was so uplifting to see people grow and feel a sense of achievement. Lisa posted weekly tutorials and ‘homework’ for the week (which was actually easy to achieve, even alongside my busy schedule), but hands down the best part of the training camp was the weekly ‘hotseat’ sessions with Lisa. This is where the camp really felt personally adaptable because Lisa is really good and analysing your mindset and giving great advise on what to work on next to help with any barriers that may arise. Everyone always came away from their hot-seat sessions excited and motivated. Lisa really encourages horse riders to view themselves as athletes, and whether you’re a high level rider or just starting out, part of being a good athlete is a healthy mindset. It’s good for the rider, and good for the horse. Mindset coaching is common in most sports, but in equestrian (aside from elite level competitors) it’s not really a topic that is very explored… and I think it should be. We get the help to ensure our horses perform well, so why not look at ourselves, beyond what’s physically required? From a competition point of view, even at a very low level our horses benefit from us having a strong mindset – most of us have experienced nerves at some point, and it’s fairly common knowledge that the horse picks up these nerves, whether it’s the fact that we start giving unclear signals, or change our normal routine – the horse feels it and in most cases doesn’t perform as well. Who could blame him – his mane is pulled tight into rosettes, his coat feels clean so he’s feeling a bit cold and frisky, and the director on top suddenly feels like a stranger.. we can’t change all of that, but we can be the one variable that doesn’t change on comp day. But beyond performance mindset coaching, I think the normal hobby rider could really benefit from mindset training too. It’s probable that horse picks up on more than you think, so it’s equally probable that he will respond well if you are mentally prepared and confident when you come to ride. I know a lot of people spend time with their horse to clear their mind (which I can definitely relate to) but the training side of things may improve if your mind is ready before you start. If you struggle with motivation or nerves or perhaps you’re lacking in confidence or have a competition goal you want to reach, I really recommend getting in touch with Lisa to see if mindset coaching is for you. Aside from lifting my motivation levels, I really came away from the camp feeling like I’d had this sort of mind cleanse – I felt I knew the direction I was headed and became far more aware of my own mental strengths. I am totally guilty of having ‘CBF’ days where I canter around in 2 point position aimlessly, or cut the ride short and wonder around the farm, and there’s nothing wrong with that occasionally but now I feel like I have a plan when I get on, a goal to achieve and a sense of satisfaction when I get off. Bye for now, and thank you Lisa for sharing your story and the work you do! If you want to know more about Lisa Ashton and EquiCoach Life, click here.